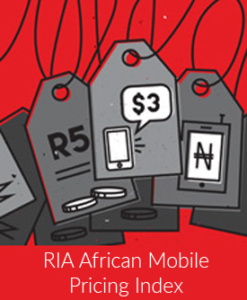 Mobile termination rate (MTR) reductions by the South African regulator in March 2013 impacted positively on prepaid mobile retail prices in the second quarter of last year. But by the last quarter of 2013, prepaid voice mobile prices had stabilised in South Africa with no further reductions in prices of the dominant operators: MTN and Vodacom. The absence of further responsiveness to pricing pressure from smaller operators, who reduced their prices dramatically during 2013, means South Africa’s dominant operator prices remain expensive compared to other African countries.